Meditations that correlate to the 7 concepts. This Cup is a bit different with simple practices that you can do to help incorporate the Seven Cups of Consciousness into your life as well as insights regarding the the quickening that began April 2017. 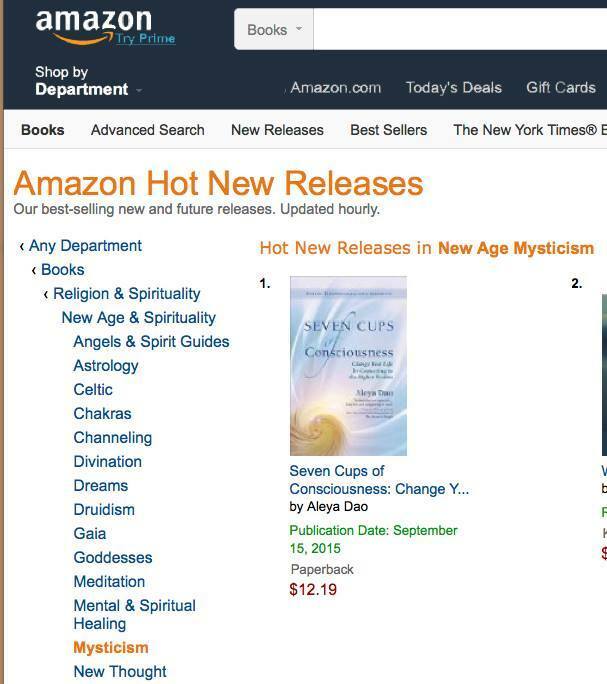 Have you read my book, Seven Cups of Consciousness yet? It will help you get a lot more from both the daily Cups and TALL Cups. On April 26th the Quickening began. As we move deeper into this clear stream of light you will find greater clarity. Anything you have been pondering and wondering about will become clear. Unhealthy and dysfunctional ways of being will quickly fall away. This quickening will also help you manifest your desires by amplifying very particular vibrations that you really value in your divine line. If you're wanting a life that is more fulfilling, you can activate the vibration of fulfillment in your Divine line. If you want a life that has more love, connection, or joy you would activate these vibrations in your divine line, same for your body, and Team. Pulling from my book, The Seven Cups of Consciousness, sip on the 3rd cup today. Use the energy of the full Moon to manifest your intentions. Fill yourself with peace, calm, abundance, happiness, love, balance and so on. Let go of needing those energies externally. Activate the vibration of your intentions and divine plan in your divine line. Pull yourself into your divine line on the front of your spine. Activate the vibration of your Soul's intentions and divine plan at the level of your Higher Self in your divine line. Invite your Body Deva to travel down its divine line into a chamber in the heart of Earth, and activate the vibrations of its divine plan and intentions in its divine line. Invite your Team to do the same. Tones and light language to assist the activation of these vibration with the sacred trinity, your Higher Self, Body Deva, and Team. May you hold the vibrations of what you desire in your divine line. Use this fresh tool box cup to use your challenges to grow stronger, lighter, brighter, and evolve. This is the 5th concepts of the 7 Cups of Consciousness. When you embrace your challenges and use them as enlightenment opportunities life's struggles begin to recede. Think of one challenge in your life you would like to shift. Explore the emotions you experience when you think of this challenge. Increase courage as you delve into the deepest emotion this challenge triggers. Invite the angelic realm to encircle you and create a safe space and help you find the root. Identify the challenge. Identify the solution or the flip. Click here to explore the solution of the challenge. The flip it section. Activate the sacred shapes, sounds, and light around this challenge. Activate the vibration of the spiritual lesson of this challenge. Swirl light, colors, and shapes that embody the solution. Tones to help you embody the vibrations and qualities your Soul is determined to attain. Gather your emotional charges that are triggered by this challenge and use sacred shapes, sounds, and light to activate the vibration your Soul is determined to attain. Retrieve all responsibility for attaining this vibration off of all outer challenges. Use your Higher Self and energy fields to attain this vibration instead of using the outer world. May every challenge be an enlightenment moment. Use this cup to increase your connection to your essence. The 7th Cup of Consciousness is about how your essence is perfect. Sip on this yummy-ness and feel your own inner yum factor where you are perfect, connected, empowered and whole. Breathe yourself into this present breath of now. Imagine a river of light flowing up and down the front of your spine. Use each inhale to pull yourself into your divine line. Invite your Higher Self to pull all your anchors and orientation points back to your divine line. Activate the sound of your essence in your divine line. Attach this ethereal column/tube of light onto the front of your spine. Pull yourself into your inner flow. Open, allow, and imagine a beautiful light flowing in this column of light. Activate the vibrations of connection, safety, peace, fullness, enough-ness, calm, gentleness, flow, beauty, perfection, and empowerment in this inner river. Receive the divine aspect of your being. Tones to activate the vibration of your essence in your divine line. May you increase the connection to your essence in every breath. Use this cup to increase the light quotient of the divine line of your body. Increase support. This is a great meditation to help heal issues with the spine. This meditation also helps your body accelerate its process of self actualization. Invite your body deva to energetically locate its divine line. Activate the vibration of the essence in its divine line. Balance the light in the divine line of the body. Activate the sacred shape of the body's essence around itself in the higher realms. Bring all the reference points back to its divine line. Tones to help activate and increase the vibration of the essence of the body deva. Invite your body deva to reference how its divine line is connected to the divine line of Earth. Your body is an expression of Earth and is connected to all of the resources in this world. Invite your body deva to activate the vibrations of all of the resources it needs in its divine line. Increase support in the divine of the body deva. When I tuned into the energy for this meditation I heard from the higher realms, "do whatever you want." So I am bringing in a meditation I recorded about helping the body awaken and enlighten itself. Your body is made up of Earth energy, the elements of Earth, it is from this world. As your body awakens its own unique consciousness it has the ability to increase its connection to the Earth energy. Use this meditation to help your body self actualize. Invite Earth to connect with your Body Deva at the level of its Higher Self. Invite your Body Deva to energetically locate and activate the vibrations of its Essence in it's divine line that runs through the spine. Invite Earth to assist your Body Deva. Invite your Body Deva to extend its divine line into the heart of Earth, and to connect with the divine cosmic loop of Earth. Your body is vibrationally linked into every resources in this world, and it has mastery over manifesting. Tones to help the body deva activate the vibration of its Essence in its divine line. Invite your Body to remember its connection with Earth/Nature. A Light language activation for remembrance and connection. May your body feel divinely connected and supported as it moves in the world. Choose a new and improved path. Shift behaviors, and alter patterns and belief systems. Link into the new grids that take us into a realm and world where we embrace all moments as opportunities for growth and evolution instead of pain and suffering. Locate the current of energy that is coming onto the planet that holds the consciousness of Unity and love. Invite your Body to let go of the consciousness of illness, aging, lack, and dis-ease as a way of transforming. Link into the grids of Unity Consciousness. Locate the trust you hold deep in your core. Choose the connection with the divine aspect of you. Choose trust and love over fear. Open up your ability to hear your Guides. Connect with the angelic beings that surround you, support you, and guide you. This Cup is a light language activation to open the ears, thin the veils, bring the awareness internal, and receive the information without distortion. This meditation can help release any conscious or unconscious arrogance. It can also be very helpful for empathic sensitivity. Move into a more powerful co-creative way of serving humanity and model right energy. If you are more conscious of your ego, it is an indicator that your ego is ready to evolve to a higher vibration. Help the process with this potent and powerful 4 minute protocol. Energetically locate any attachment that you have placed on another for their journey, actions, or behavior. Bring all of your attachment off of them and back to you at the level of your Higher Self. Attach to your own journey, no-one else's. Return all responsibilities that you are carrying for another person's journey, behavior, actions, and decisions. Retrieve all responsibility for your own journey, growth, evolution, and behavior. Send all relevant and appropriate information to them at the level of their Higher Self where they have the capacity to receive it. Release the attachment, return the responsibility. Bring all of your gifts, tools, wisdom, and mastery back to you at the level of your Higher Self. Use your gifts on you and for you, and model that in the world. Hold compassion and a safe space for others as they journey. A great tool box one. Open to receive new grids of abundance with grace and ease. Calibrate yourself to pass through to a higher dimensional consciousness. Come into the present breath of now. Connect to your Higher Self that energetic aspect of you. Bring your awareness onto your core column of light. Open all of your internal receptors. Open your channels for receiving and are aligned to your essence. Wishing you increased awareness and consciousness in every breath.